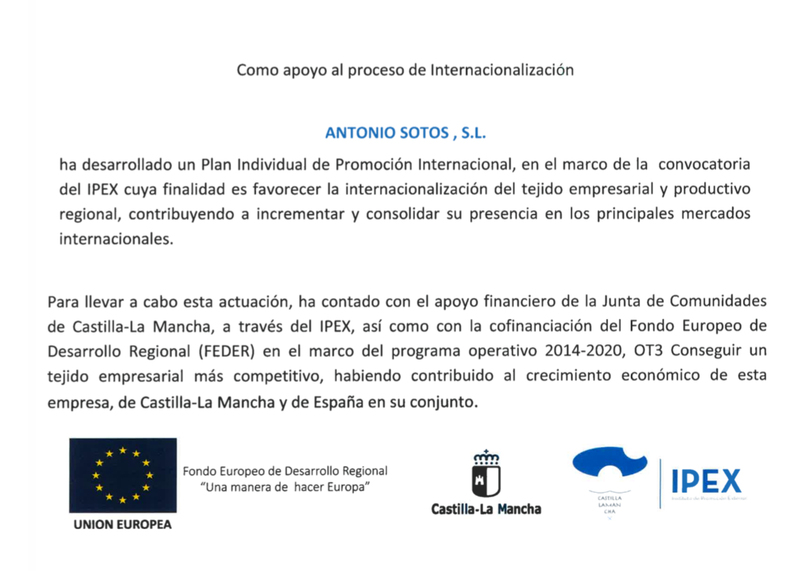 Located in La Mancha region, ANTONIO SOTOS, S.L. is the fourth generation in a family business with over 100 years experience dealing with saffron. Established in 1912, it soon focused its business overseas, being one of the pioneer companies in the foreign trade of saffron.Nowadays, thanks to our experience and the efforts we have made, we can proudly say our products are distributed in more than 30 different countries, in 4 different continents such us Europe, Asia, America and Oceania. Our brands “ANTONIO SOTOS GOURMET” and “SAFFROMAN” are recognized all around the world as a sign of quality and reliability. Manufacture and supervision of our products is done under the strictest rules of quality and control, having obtained the International quality Certifications in IFS (International Food Standards), BRC (British Retail Consortium) and ISO 9001:2008 for handling, packing and commercialization of saffron. Our mission is to foment the use of saffron worldwide promoting our products and offering to our customers the best quality adapted to their needs, at a competitive price and with an exclusive attention. Our vision: we are growing to become one of the worldwide saffron sector leaders with a firm focus on the future.